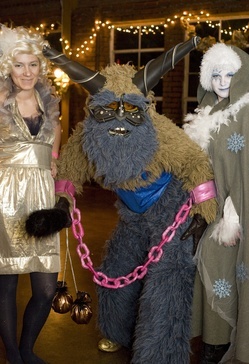 Posted on Mon, Dec 12, 2011 : 5:50 a.m.
Krampus poses with Natalie Berriz of Ann Arbor, left, and Karrie Waarala of Ypsilanti at last year's ball. The main event will be held at the Corner Brewery (720 Norris Street, Ypsilanti) on Dec. 17, beginning at 7 p.m. Then around 11:30 p.m. the Detroit Party Marching Band will lead a parade over to Woodruff’s (36 East Cross, Ypsilanti) for an “Elbow Deep” after party. A mythological punisher of bad children found in European folklore, you can think of Krampus as the dark, beastly sidekick of Santa Claus. Instead of rewarding good children with presents, Krampus is there to scare and punish the bad ones. The anti-Claus will be in attendance at the costume ball to interact with and “punish” guests. This time, he’s bringing a date: A Lady Krampus will make her debut this winter. According to event co-organizer Jennifer Albaum, “Lady Krampus is definitely nasty, just like her male counterpart." Their parts will be played by Spontaneous Art members Trevor Stone and Natalie Berry (both staff at the Neutral Zone teen center), who received a Krampus mini art grant. Who: All welcome (age 21 and up), presented by the Shadow Art Fair. Where: Corner Brewery, 720 Norris Street, Ypsilanti. After-party at Woodruff's, 36 E. Cross, Ypsilanti. When: 7 p.m. Saturday, Dec. 17. How much: 2 cents admission. Everyone who attends will be a part of the collaborative performance of the Krampus Costume Ball. You are encouraged to make your own costume, be a walking art sculpture, or just dress up in your fancy clothes. “There aren’t any rules. We leave it really open ended. Last year, people dressed all kinds of ways, from snow monsters to people in formal wear. We had a good mix, and people put a lot of thought and creativity into their costumes,” Albaum says. You can choose if you are feeling naughty or nice for yourself at the event, by selecting between two "Naughty" or "Nice" beers, which Corner Brewery is brewing especially for the event. Sometime around 11:30 p.m. “The Detroit Party Marching Band will come by and wrangle everyone up to start a parade over to Woodruff’s for the “Elbow Deep” drag show after party. Like last year, they will get everyone riled up and ready to march through the streets to get over there, where we will continue to dance and have fun,” Albaum explains. Before last year’s premiere of the Shadow Art Fair’s “Krampus Costume Ball,” organizers hosted arts and crafts vendors and live music each winter, like the Shadow Art Fair held this past summer. However, last year, they tried something different and introduced Krampus into Ypsi’s mix. “We’re always trying new things. Last year, we didn’t know what the response or impression of the Krampus ball was going to be. Some people were skeptical, or they wondered why we weren’t going to host vendors. But it seemed like everyone had a good time, and we’re excited to see how the word is getting out about this one,” Albaum says, reporting that, assuming the event is again a success, they will likely throw it again next winter. Mon, Dec 12, 2011 : 4:44 p.m.
Mon, Dec 12, 2011 : 3:52 p.m.
What an extraordinarily fun, creative and innovative event! Bravo to all involved!!!! Mon, Dec 12, 2011 : 2 p.m. The Krampus Ball and Shadow Art Fair is what Public Art is all about. AAPAC take note. I take that back. Don't bother, you'd screw it up.